Wizz Air changes flights pretty frequently based on demand for a given flight. Generally the prices go up as we get closer to departure, but there are still opportunities to find better deals later. AirHint has just launched Wizz Air flight price predictor to help travelers to find the best moment to book their tickets. 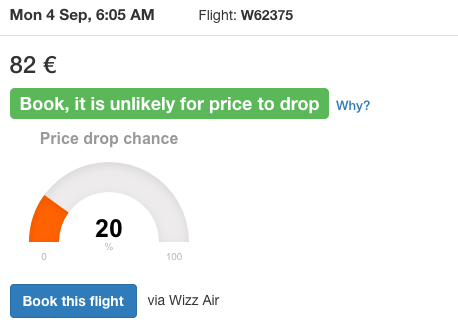 It calculates the chances of a price drop from now to the time of departure. That could serve you as another signal when searching for flights and deciding when to book. The algorithm is still in the best version and as it is being tweaked.